Four Columns with Tulle and Lights draped to center . 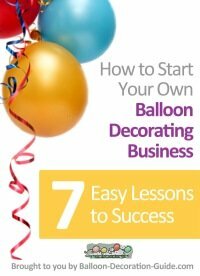 . . can a helium balloon hold it up? I am going to have four columns on the corners of a dance floor; with tulle and light strands draped to the center of the floor. 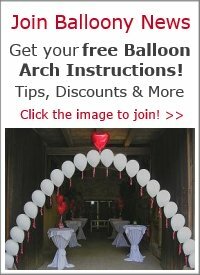 What size and how many balloons would it take to keep the tulle and lights up for my reception? Please let me know asap - my event is this weekend. Or if you have another suggestion with photo. Comments for Four Columns with Tulle and Lights draped to center . 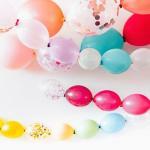 . . can a helium balloon hold it up? According to the Balloon Helium Chart, the lifting capacity of an 11 inch balloon is 0.35 ounces (= 10gr), of a 16 inch balloon 1.2 ounces (= 34gr). So you would have to check the weight of the tulle and light strands and then calculate how many balloons you would need. I personally would advise against relying solely on the lifting capacity of helium filled balloons to hold up the tulle and light strands. It would be much better to attach the center of the canopy to the ceiling. Please also see my comments about a balloon canopy. 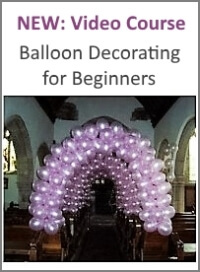 I would love to see a photo of your balloon decoration (it does not have to be from a wedding, pictures from birthday parties or other events are welcome too).